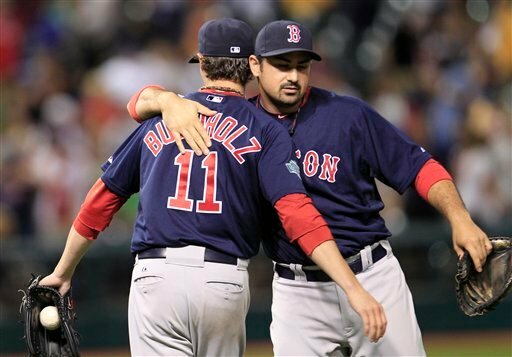 CLEVELAND (AP) — Clay Buchholz pitched a two-hitter, Cody Ross hit a two-run homer, and the Boston Red Soxbroke a three-game losing streak by beating the Cleveland Indians 3-2 on Friday night. Buchholz (10-3) gave up one earned run in his second complete game of the season and fifth of his career. The right-hander improved to 8-2 in 17 starts following a loss the last two years. Ross broke a 1-1 tie with a 420-foot shot over the wall in center field off Chris Seddon (0-1) in the sixth inning. Asdrubal Cabrera had both Cleveland hits, including his 13th homer, but the Indians had their two-game winning streak broken and lost for the 12th time in 14 games. Boston third baseman Will Middlebrooks left in the ninth after being hit in the right wrist with a pitch from Esmil Rogers. Buchholz hasn’t allowed more than two earned runs in five consecutive starts, the longest streak by a Boston starter since Tim Wakefield did it six times in a row in 2002. Buchholz didn’t get a decision in three of those outings, however. The right-hander gave up Cabrera’s one-out homer in the first and an unearned run in the sixth. He struck out six, walked none, and moved to 6-1 with a 2.08 ERA in 11 starts since May 27. The Red Sox tied it at 1 with an unearned run in the fourth after a throwing error by Seddon. Mike Aviles drew a one-out walk and advanced to third on a wild pickoff throw by Seddon. Dustin Pedroia singled him home. Boston’s leadoff batter Jacoby Ellsbury was twice robbed of potential hits as Cleveland preserved the 1-1 tie. In the fourth, left fielder Ezequiel Carrera dived to his left to snag a line drive hit by Ellsbury in the left-center gap. In the fifth, center fielder Michael Brantley raced in and dived along his stomach to take away a potential bloop hit. Pedroia singled with one out in the sixth, and one out later Ross connected for his 18th homer to make it 3-1. Cleveland scored an unearned run in the bottom half when Jason Donald went to third as Boston made two errors on his leadoff grounder up the middle. Pedroia got in front of the ball, but it skipped past him. Aviles backed up the play, tracked down the ball in short center, and threw to first because Donald made a wide turn with the idea of trying for second. He ended up walking to third when Aviles’ throw skipped into the stands behind the Boston dugout. Donald scored on Carrera’s sacrifice fly to make it 3-2. Seddon allowed five hits and two earned runs over six innings in his second start since the Indians purchased the left-hander’s contract from Triple-A Columbus on Aug. 5. NOTES: Boston LHP Felix Doubront will miss his next start, and RHP Aaron Cook will start Wednesday against Baltimore. Red Sox manager Bobby Valentine says Doubront’s velocity has been down, and he might be helped by skipping a start. … OF Scott Podsednik, signed by Boston before the game, started in left field and batted ninth. He was traded to Arizona on July 31, but was released after declining an assignment to the minors. … OF Ryan Sweeney (broken hand) was moved to the 60-day disabled list to make room for Podsednik on the 40-man roster. … Indians DH Travis Hafner, on the DL with a bulging disc in his back, had an injection to relieve inflammation. There is no timetable for his return. … Cleveland released RHP Derek Lowe, who had been designated for assignment on Aug. 2.